The attack also hit the official base for the Multi-National Joint Task Force tasked with beating back the militants. It’s a further blow to a force that was already struggling. The MNJTF originally planned to incorporate 700 soldiers each from Nigeria, Niger, Chad and Cameroon to counter the insurgents in a region where borders have little practical relevance. But the MNJTF never took off, and now Niger has officially ruled out helping Nigeria take back Baga. Chad and Cameroon kept their distance from the project, citing Nigeria’s unwillingness to live up to its troop commitments for the force. The 2014 defence budget was $2.1 billion and the overall security allotment $5.8 billion – the largest slice of the government’s expenditure pie. And yet the regular excuse is that its soldiers are out-gunned by Boko Haram, despite the helicopter gunships, ground-attack aircraft, and surveillance drones in the official inventory. … Corruption is said to the biggest enemy, with money and fuel meant for the troops siphoned off by senior officers. The repeated failure to destroy munitions and equipment before positions are surrendered to Boko Haram is another factor, as is – sadly, given Nigeria’s peacekeeping pedigree – military incompetence. When the troops are well led and properly supplied they win their battles. But there have been repeated reports of the military even failing to make use of reliable intelligence provided by its allies. And now the government has splurged on opaque defence contracts, with more helicopter gunships, mine-resistant armoured vehicles and possibly a squadron of new, never-before flown by any other air force, counter-insurgency aircraft. 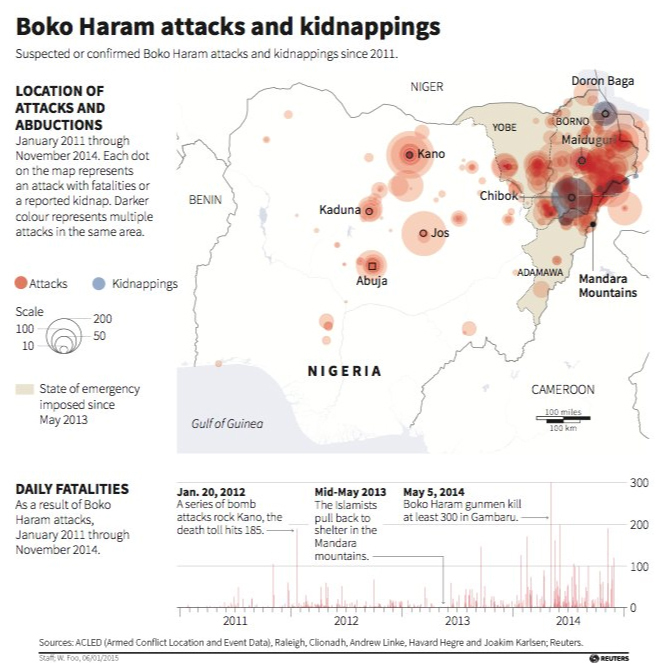 From an ideological perspective, Boko Haram [will] undoubtedly seek to undermine any process which would underpin its greatest adversary; namely, a secular Western-styled democracy. By violently disrupting the election cycle, the sect could raise serious questions regarding the perceived inclusiveness and transparency of the ballot—a move which could delegitimize the voting process and its eventual victor. The parties contesting the vote can best respond by toning down their mutual antagonism and bloodthirsty rhetoric. The government must also try harder to provide security for polling places, especially in the north, and speed up its introduction of biometric voting cards. More international observers, deployed for longer, would help. There’s a limit to what outsiders can do, though. The U.S. and U.K. have curtailed cooperation with Nigeria’s beleaguered army because of human-rights abuses. Specific, vetted units might still be receptive to training and assistance. Beyond that, strengthening the ability of Nigeria’s neighbors to prevent Boko Haram’s incursions might be the best outsiders can do. [A]fter a year in which Boko Haram and government corruption has dominated local headlines, the ex-general has two things going for him: a reputation for strong leadership and incorruptibility. He is probably the only prominent Nigerian politician today who isn’t hounded by allegations of embezzling public funds. [Also, a] president with military experience to take on corrupt army officers would surely serve as a morale booster to the Nigerian soldiers battling Boko Haram. Granted, the ex-general has no magic wand to make the militants simply vanish. But in this period of existential crisis, Nigeria may need a wartime leader who can project reassuring strength and provide a plausible strategy for overcoming the insecurity in the country. Time is running out. About 500 politicians, officials and businessmen were jailed as part of a campaign against waste and corruption. Some saw this as the heavy-handed repression of military rule. But others remember it as a praiseworthy attempt to fight the endemic graft that prevented Nigeria’s development. He retains a rare reputation for honesty among Nigeria’s politicians, both military and civilian, largely because of this campaign. As part of his “War Against Indiscipline”, he ordered Nigerians to form neat queues at bus stops, under the sharp eyes of whip-wielding soldiers. Civil servants who were late for work were publicly humiliated by being forced to do frog jumps. He also introduced a notorious decree to restrict press freedom, under which two journalists were jailed. However, his attempts to re-balance public finances by curbing imports led to many job losses and the closure of businesses. Previous Previous post: Which Romney Will Run This Time?